The lion dance's ancient rituals are said to bring good luck. 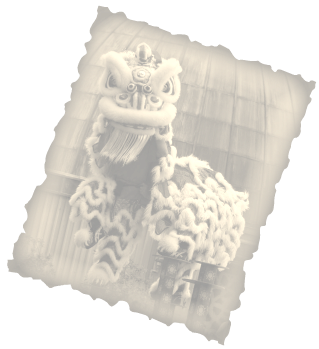 Legend has it that during the Sung Dynasty, the villages of Foshan in the Guangdong province of southern China were plagued by a monstrous wild creature. Each Lunar New Year, it would wreak havoc in their paddy fields, completely destroying the next year's rice crop. The villagers called it Nian because, as it went about its deadly work, it uttered loud, terrifying cries that sounded like "nian, nian, nian". One New Year's eve, the villagers took their courage in hand and fashioned a huge head from bamboo strips. They pasted colored paper on it and, with small triangular pieces of colored cloth, fashioned a body that was long enough to hide two men. By raising and lowering the head and body, the men would imitate the Nian's movements, a sort of animated scarecrow. Just as the beast began to ravage the fields, this homemade creature leaped out of its hiding place and pranced about to the accompaniment of clashing pots and pans, drums and cymbals. The Nian, surprised and shocked to have his annual feast thus interrupted, took to his heels, never to be seen again. Thus was born the Lucky Lion. The villagers celebrated their victory every New Year's eve thereafter, and the custom spread to other villages in the province and beyond. and green head featuring black eyebrows and beard, red eyes, broken ears, a green nose, jutting teeth, an iron, horn, and many small bells on the black and white body. out its eyes. There's much cheering when those two oranges disappear into the pockets of the dancers, and even more as they "swallow" the snake (the lead dancer passes the sugar cane through the lion's mouth to the tail dancer, who then chops it into pieces with his hand). Then, like a big, contented cat, the lion regurgitates a bit of what it had eaten -- that's when the good luck is returned. Again like a cat, it washes itself after its meal scratching its mouth, mane, ears and body. Well groomed and well fed, it cranes its neck high in the air with a mighty upward thrust. Only then, to shouts of great merriment from onlookers, do the dancers take three well-deserved bows.